My name is James Deas, and I’m originally from Homestead, Florida, now I live in Ocala, FLorida. When I found out that I had prostate cancer and was referred here by my urologist. He assured me what a great center it was, and that’s Dr. Dersch. He assured me that he came down here 2 or 3 days a week and worked in some capacity, and he just had all kind of good things to say about it, and he said you’ll like it down there. And sure enough, on my first visit down here, I brought my son with me, just as a support. I met with Fred, he was one of the radiologists here. 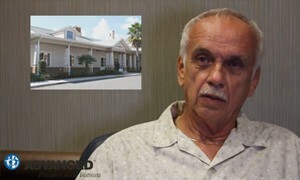 He took me in, showed me some of the equipment and explained a little bit of what would happen and told me that I would come back a short while later for what they call a walk-through, where they put you through the CAT scan machine, and that would be after I went back to my urologist and got the gold markers put in.